Swype Keyboard Finally Out Of Beta; Supports Urdu, Tamil, Hindi and Hinglish! Quick info first: Swype keyboard is a Android Keyboard app, priced Rs 53.83, and is available on Google play store right now. The app has a free 30 days trial and you can install it from here. Little History: In the year 2008, Swype blasted its way into the Android eco-system when it got featured on TechCrunch. It was described as an “amazing gesture based data entry system that truly blew our collective minds”. It is based on a patented technology which allows touch screen users to type words super fast: You can just swipe your fingers and the words will magically appear on the screen. An average user can type swipe real fast with this keyboard app, and it has been found that 40-50 words per minute is the average speed with Swype; wherein you just need to scribble on the screen in order to type the words. It became so popular that after 2011, that many Android devices came with a free beta version of Swype by default. And a guy also won Guinness Book of World Records for fastest text typing on a touchscreen using Swype! 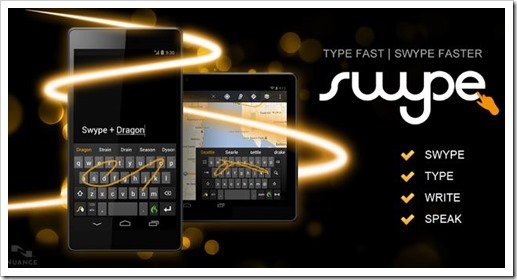 In the year 2010, they launched their beta version and till yesterday, Swype was still in beta stage. Swype created some news in the year 2011, when Nuance (voice recognition technology company) acquired them for reportedly $100-$150 million. After that, things were pretty much cold, until yesterday, when they finally launched their live apps in the Google Play Store market. They have rolled out two versions as of now: One is a free trial for 30 days and the other is priced at 99 cents or Rs 53.83 for Indian customers. Isn’ this cool? Swype now supports four Indian languages namely: Hindi, Tamil, Urdu and Hinglish (mixture of Hindi and English). This feature may certainly very appealing for Indian users as they tend to speak a lot in Hinglish. Most probably world’s first crowd-sourced mobile dictionary which is updated every second. It covers almost 20 dialects from all over the world. Not only official words, but it also updates all trending words like Singlish which is trending in Singapore. You can watch which words were updated today by visiting here. Imagine you have a personal assistant who can predict which words you are going to use! Swype has this amazing capability called “Personal Language Model” which uses a robust Dynamic Language Model which can intelligently predict your next words based on the relationship between the words and your history of typing. Cutting edge, I am sure! No matter which Android device you are using, Swype will create a backup of your dictionary and auto sync it across all the devices. Hence, when you start your message on a smartphone, you can carry it forward to a tablet without bothering about the dictionary or words. Swype will follow you everywhere. In case you are planning to use this new Swype keyboard app, then do share your views here! Of Languages and Translation and the Millions yet to be made!